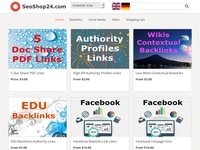 On SeoShop24.com get cheap deals for webmasters and from the social media area. Here you are right if you build backlinks for your website or to extend the reach of your social networks. 15% of the net revenue for all completed orders. My purchases are allowed.